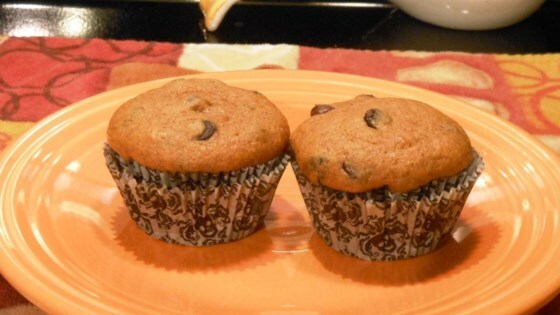 "These muffins are so easy! One can of pumpkin makes 36 muffins. So inexpensive, and super yummy!" Preheat oven to 350 degrees F (175 degrees C). Grease 36 muffin cups. Whisk self-rising flour, 2 1/2 cups sugar, and pumpkin pie spice in a large bowl; stir pumpkin, eggs, and vegetable oil into dry ingredients until batter is smooth. Scoop batter into prepared muffin cups. Stir 2 tablespoons sugar with cinnamon in a small bowl and sprinkle the cinnamon sugar over the muffins. Bake in the preheated oven until muffins are lightly golden brown and a toothpick inserted into the center of a muffin comes out clean, about 20 minutes. These muffins are moist and tasty, and freeze well. Love these! Followed the recipe, except for making up my own batch of pumpkin spice and these came out perfect! I also got 2 dozen like the other reviewers. This makes a tasty muffin. I used all purpose flour with 2 tsp baking powder, 1 tsp baking soda, and 1 tsp salt. I also added 1 cup of raisins and a cup of chopped pecans.